Histones are primary protein components of eukaryotic chromatin and play a role in gene regulation. H3 and H4 histones have tails protruding from the nucleosome that can be modified post-translationally	to alter the histone's interactions with DNA and nuclear proteins, leading to epigenetic changes for regulating many normal and disease-related processes. 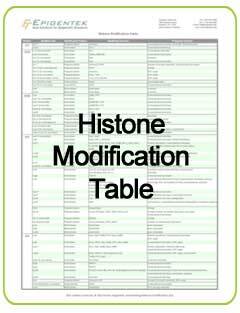 Epigentek offers a complete series of kits available for the quantification of methylation, acetylation, and phosphorylation of H3 histones at all sites (see our informative histone modification table). We offer the most comprehensive selection of Histone Modification research products to cover every step of your experiment workflow, from upstream to downstream. Screen and measure up to 21 different histone H3 or 10 different histone H4 modification patterns in a single ELISA-like kit. Simultaneously screen and measure 21 different, well-characterized histone H3 modifications in only 2.5 hours. EpiQuik Histone H4 Modification Multiplex Assay Kit (Colorimetric) In a simple 2 hour and 30 min procedure, detect and quantify nearly all histone H4 modifications (10 different types) simultaneously. Simultaneously detect and quantify up to 22 different, well-characterized modified histone H3 patterns directly from plasma/serum in only 2.5 hours. Histone lysine methylation, histone arginine methylation, and other histone methylation antibodies. Histone lysine acetylation, HDAC, and other histone acetylation antibodies. The mechanism known as histone methylation is a post-translational epigenetic modification that involves the transfer of methyl groups to histone proteins via histone methyltransferases (HMTs). Methyl groups are added to the “tails” that protrude from the histone proteins, which is the most common location for post-translational modifications, especially N-terminal tails. Alternatively, histone demethylation is the removal of methyl groups from the histone tails catalyzed by histone demethylases (HDMs). Histone methylation and histone demethylation are epigenetic modifications that have the power to reduce or bolster gene expression, especially as a result of altering chromatin structure. A histone is a protein that helps to comprise the structure of chromatin, which is composed of DNA-wrapped protein octamers. These octamers consist of duplicates of four core histones (H2A, H2B, H3, and H4). This unit of chromatin is commonly known as a nucleosome. Transcriptional repression or activation can occur as a result of histone methylation or demethylation due to the loosening or restriction of the chromatin structure. 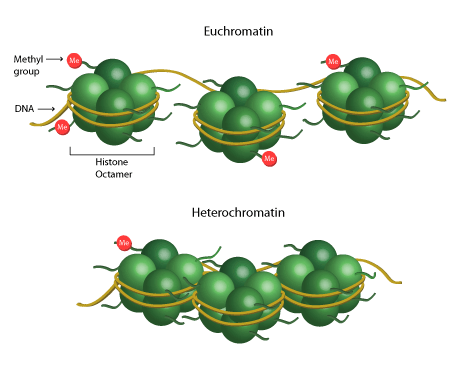 Heterochromatin and euchromatin refer to the chromatin structure that consists of either tightly or loosely packed DNA around histones, respectively. Heterochromatin is transcriptionally inactive whereas euchromatin is transcriptionally active. Where and how many methyl groups are added to the histones largely determines whether the chromatin is available to transcription or not. Tail residues — lysine (K) and arginine (R) — may be methylated at varying degrees with differing outcomes. For instance, when histone H4 is monomethylated on lysine 20 (H4K20me1), this common histone modification results in the contraction of chromatin. Restricting the chromatin structure prevents transcription from occurring and reduces gene expression. Alternatively, monomethylation of histone H3 on arginine 17 (H3R17me1) leads to transcriptional activation. Lysine methylation has been involved in both transcriptional activation (H3K4, K36, K79) as well as silencing (H3K9, K27, H4K20), and studying the effects of these histone modifications will allow researchers to better understand how the transfer or removal of different amounts of methyl groups to or from various lysine or arginine residues will impact gene expression. The “histone code” attempts to describe the way histone modifications function together in various combinations to control certain cellular processes. By measuring histone modifications, researchers can uncover novel epigenetic insight into cellular processes and disease states. Abnormal modifications, for example, have been connected to numerous different diseases, ranging from cancer to autoimmune disorders and inflammatory and neurological diseases. In addition to better understanding the epigenetic underpinnings of the pathological disease process, detecting histone modifications can also aid in the development of histone modification-targeted drugs. Histone acetylation is an epigenetic modification characterized by the addition of an acetyl group to histone proteins, specifically to the lysine residues within the N-terminal tail. This histone modification is catalyzed by enzymes known as histone acetyltransferases (HATs). The two different types of HATs – cytoplasmic and nuclear – are determined based on intracellular location and histone specificity. Alternatively, histone deacetylases (HDACs) act to remove acetyl groups in a process known as histone deacetylation. Similarly to other histone modifications, histone acetylation/deacetylation impacts chromatin structure and, in turn, gene expression, by making the DNA more or less accessible to transcription. Acetylation of lysine residues leads to a transcriptionally active chromatin structure (euchromatin) and deacetylation leads to an inactive, condensed chromatin structure (heterochromatin). There are four major classes of HDACs: Class I, Class II, Class III, and Class IV. HDAC1, HDAC2, HDAC3 and HDAC8 belong to Class I. HDAC4, HDAC5, HDAC6, HDAC7, HDAC9 and HDAC10 belong to Class II. Seven sirtuins, including SIRT1 through SIRT7, belong to Class III. Lastly, Class IV consists of only HDAC11. These classifications are based on their homology to yeast proteins. By studying histone acetylation and histone deacetylation, researchers can gain more insight into the “histone code.” This research can also help contribute to the development of HDAC-targeted drugs. For instance, histone deacetylase inhibitors (HDACi) are often used as mood stabilizers and anti-epileptics and more recently have been applied as possible cancer, neurodegenerative, and inflammatory disease treatment. Interestingly, HDAC inhibitors are known to have specificity toward tumor cells, which may explain their widespread use as anticancer drugs. Histone phosphorylation is a post-translational modification that affects serine, threonine and tyrosine residues. It involves the addition of a phosphoryl group to histone tails, which can play a part in chromatin remodeling. It is possible for all four nucleosomal histone tails to be phosphorylated. One of the best-known functions of histone phosphorylation involves the cellular response to DNA damage. Although numerous phosphorylation sites have been discovered, new sites are being uncovered in ongoing epigenetic research.